Twelve DNCBers enjoyed a cool but dry, sunny and very pleasant Tuesday morning at another prominent birding spot in the Lower BC Mainland, Iona Regional Park. Check out some amazing shots of the mornings sightings on our FLICKR site: go to www.flickr.com/groups/dncb, then click the magnifying glass icon in the “Photo Pool” row, and add 2017-02 to “ DNCB Photos” in the Search box at the top of the page. Five of us (Mike, Terry, Roger 2, Chris and me) car-pooled nicely from Petra’s at 7:30 am in my new (to me) Range Rover. HOV lane through the tunnel was quick and easy and we got to the Iona parking lot around 8:00 am. Roger One and others were waiting there and the front pond was frozen so not much on it. Seeing the Snow Geese in the Bay, we decided to head to the beach first. There were about 3000 Snow Geese close to shore and we saw V’s above of another 2000.
and several flocks of Dunlin flew by too. Richmond Donna even spotted a Whale, which turned out to be a wave going over a sand bar. The brilliant sun was rising behind us, so good for photogs. Before starting our wanderings through the Park, Roger and Tony took a couple of Group Photos of us facing a flock of Mew Gulls resting on the frozen pond. The Dirty Dozen were: Rogers 1&2, Mike B, Terry C, Richmond’s Brian A & Donna T, sisters Pat & Maureen, ILB Tony M, Liz S, time-challenged Margaretha and me. The regular Iona stuff was in the bushes including Spotted Towhees, Golden-crowned Sparrows, Red-winged Blackbirds, Robins, House Finches, etc. with Northern Flickers and the occasional Anna’s Hummingbird providing a bit of excitement. 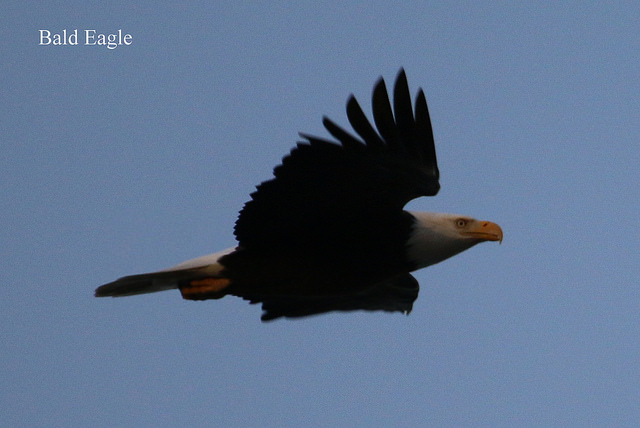 and a pair of Bald Eagles in a tree overlooking the scene. So we simply enjoyed our communal chatter as we walked to the back gate of the Sewage Ponds. There were tonnes of birds in the Sewage ponds, mostly in the northwest open pond. Lots of Northern Pintail, American Wigeon, Mallards with Green-winged Teal, Gadwall, Lesser Scaup and Ring-necked Ducks. Roger finally found our Target Bird, a Tufted Duck, and our photogs got good shots. A Red-tailed Hawk was in the tree but we couldn’t find a falcon. While photographing an accommodating group of Long-billed Dowitchers, a Wilson’s Snipe called and quickly flew by beside us toward the Fraser. We tried in vain to find it again and get a better look. Dunlin and Killdeer were there too. We left the sewage ponds and walked through the trees and along the Fraser River. Nothing new seen, but the vistas along the river and of the city and mountains were spectacular, as usual. 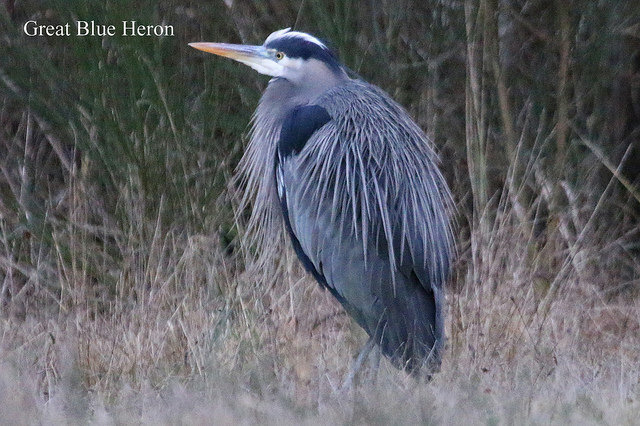 Great Blue Herons are always photogenic. We were blanked on normally-seen Western Meadowlarks and Northern Shrikes. We got back to the parking lot shortly after 11:00 am and decided it was time for a DNCB Lunch. Of course, the wayward Margaretha finally found us here and nine of us went to the Flying Beaver. We arrived before 11:30 am so some of us had the huge Breakfast Special (poached eggs, bacon, sausage, spuds, toast) of course with a pint of Okanagan Springs Pale Ale, also on special. A glorious finish to another very enjoyable DNCB outing. Next Tuesday, January 17, we will leave Petra’s at 7:30 am for an outing in White Rock. We’ll meet at the WR Pier around 8:00 am, to take advantage of the early free parking. Following our jetty walk, we’ll go to Blackie Spit. 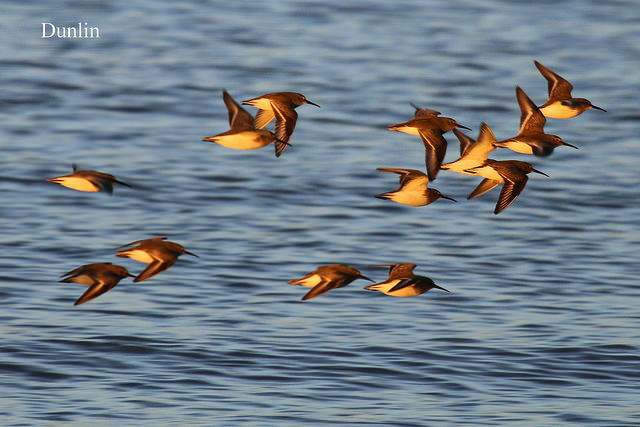 This entry was posted in *DNCB, Bald Eagle, Dunlin, Iona, Long-billed Dowitcher, Mew Gull, Red-tailed Hawk, Ring-necked Duck, Sewage Lagoons, Tufted Duck, Virginia Rail, Wilson's Snipe. Bookmark the permalink.